The story of The Infected takes place in the year 2020 in Tower City, where a virus, that turns super humans into flesh-eating zombie-like creatures, has been unleashed. The government quarantines Tower City and began to round up all superhumans in an attempt to contain the virus. The source of the virus is unknown, however, the superhumans begin to believe that the government is behind it's release. Readers are quickly introduced to Jacob, who awakens to a city ravaged by the violence between the superhumans and the government. He eventually meets up with Freedom and Chloe, and they begin a quest to find out who is responsible for the devastating virus. It is said that art sells comics before the story does. If this is the case, then The Infected will have no problem selling issues, based on the artwork alone. I absolutely loved the art direction for this story. Dave Mims' art style is unique and perfectly complements the story (more than any comic book I can remember). As for the story itself, this series provides a unique twist on the zombie apocalypse genre. A city full of zombie superhumans opens up all kinds of interesting adventures and story possibilities. Issue number one gets off to a great start with the protagonist, Jacob, waking up in a desserted hospital or laboratory, with no recollection of the events that have led to the current state of affairs. Chris Hartmann did an exemplary job building suspense from the beginning, and building upon that suspense throughout the issue. I was completely captivated with the story and found myself reading through this comic very quickly. If there is any problem I had with the story, it may be that the pacing was a little too fast. Things developed very quickly from cover to cover in this 27 page comic. I wish the issue were a few pages longer, so that things could have been spread out a little more. That is a very minor gripe, and in no way takes away from a very satisfying reading experience. 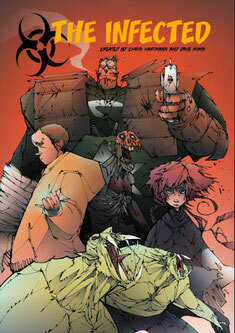 The Infected Issue number one is a great kick-off to what looks to be a really good series. The artwork will attract you, but the story will hold you. I can't wait to see how the story develops. I suggest that you pick this one up. + Interesting Story and Unique Twist on Zombie Genre. Unique Art Style and Visual Direction. Easy to Follow Story. - Pacing a Tad Too Fast.